Eleanor is happy to be living with her brother and sister-in-law. She loves helping with her mischievous nephew, John. When John gets away from her one day, it sets off a chain of events that will change her life. A short short story of faith, friendship, and family. A prequel story for Brothers and Betrayal. This was a lovely little romance that warmed my heart without being sticky and yucky. It stood well on its own, though I may have to go listen to the novel soon. 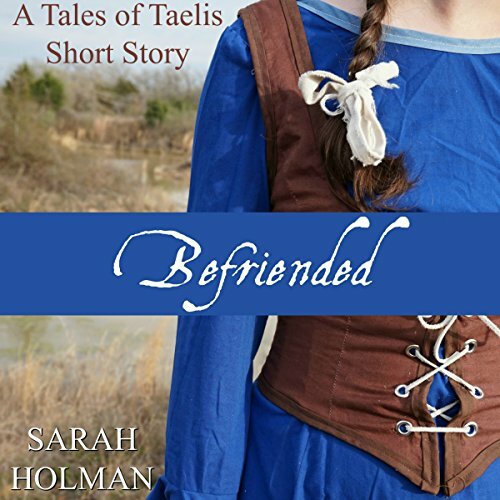 I hadn't read any of Sarah's Tales of Taelis stories before, so this was my first taste of them. I enjoyed it and wouldn't mind reading more in the future. The only thing I didn't like about this audiobook was the narrator's voice for Eleanor was too high-pitched and whiny. She made Eleanor sound like a little girl rather than a young woman. Even though I hadn't read any of the Tales of Taelis books before, I was still able to find each of the characters interesting. Sarah did a good job introducing each character, especially those who must have shown up in a previous book.I especially liked Kaden (spelling may be wrong since I listened to it rather than reading it). The dialogue was well-written and fit the story well. As I mentioned in my introduction. The only part I didn't like was when Eleanor was read by the narrator. The plot definitely kept my interest through the whole story. I'm so glad I was able to listen to this book. It had a great message about waiting for God to send the right man for marriage. I can personally attest to that, too. The writing quality was very good. Obviously, since I didn't read the book, I can't say conclusively there were no typos, but from the sound of it, there weren't any. The plot structure was well done, too. This audiobook is about 30 minutes long, so it was easy to keep listening until the end, especially since I was listening at 1.15 speed until the end when I wanted to make sure Eleanor's whiny voice wasn't due to the faster speed. Even if it had been longer, though, I think it would have been very hard to put down. I wanted to know what happened! If you like a short romance story, this is a good one. It may be in a fantasy genre, but it doesn't have magic or anything like that in it. There is also a good amount of mention of God in it, so this world must have a Christian religion structure to it. If I had read the book rather than listening to it, I would have enjoyed it even more, but I will still give it a five star rating.